Anti-Bevacizumab Antibodies (recommended for ADA assay) on SDS-PAGE under reducing (R) condition. The gel was stained overnight with Coomassie Blue. The purity of the protein is greater than 95%. Anti-Bevacizumab Antibodies bridging ELISA for Anti-Drug Antibody (ADA) assay development. 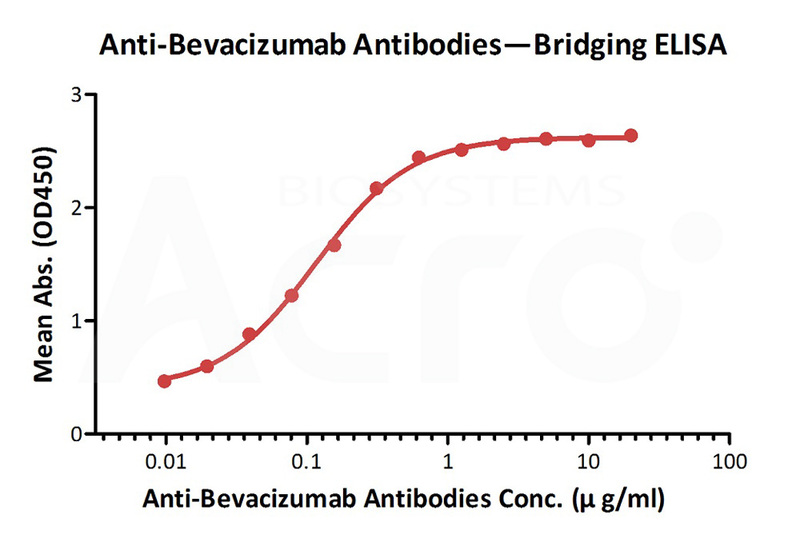 Immobilized bevacizumab at 0.1 µg/ml, add increasing concentrations of Anti-Bevacizumab Antibodies (recommended for ADA assay) (Cat. No. 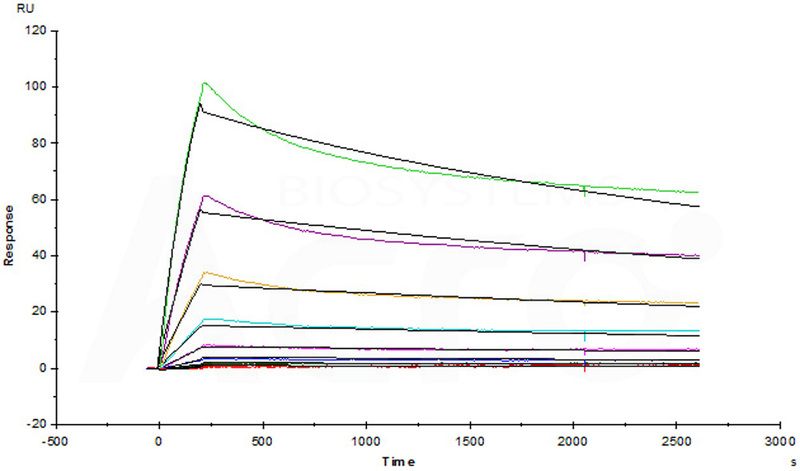 BEB-Y9, 10% human serum) and then add biotinylated bevacizumab at 5 µg/ml. Detection was performed using HRP-conjugated streptavidin with a sensitivity of 9 ng/mL. 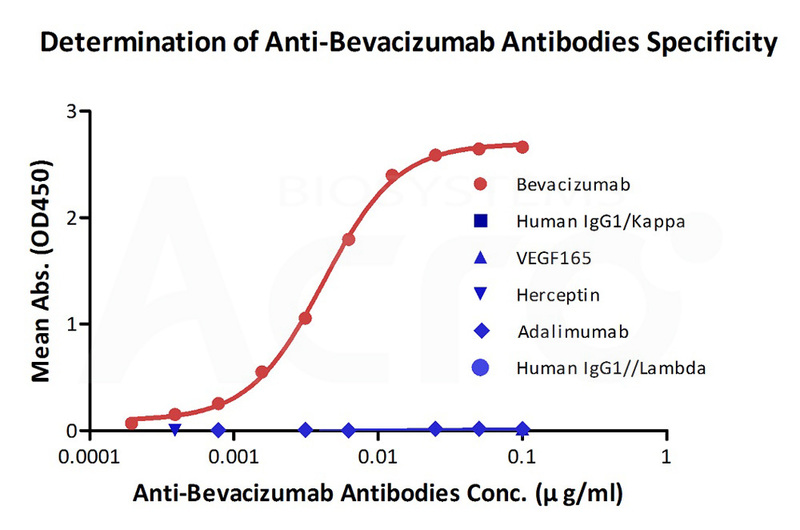 Demonstration of the specificity of Anti-Bevacizumab Antibodies (recommended for ADA assay) (Cat. No. BEB-Y9) to the bevacizumab. 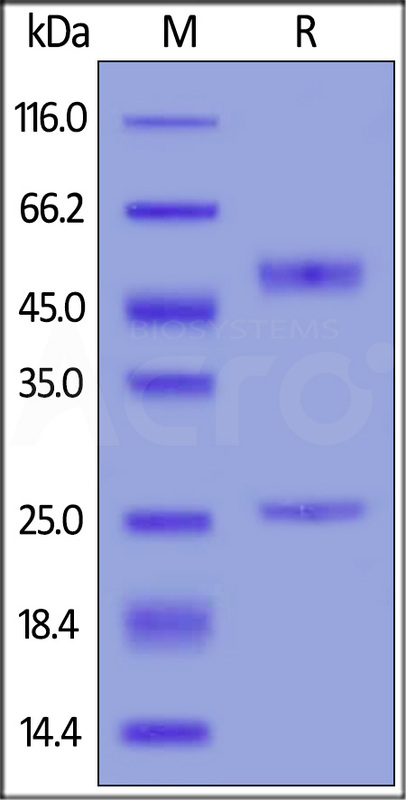 Measured by its neutrlizing ability in a functional ELISA. 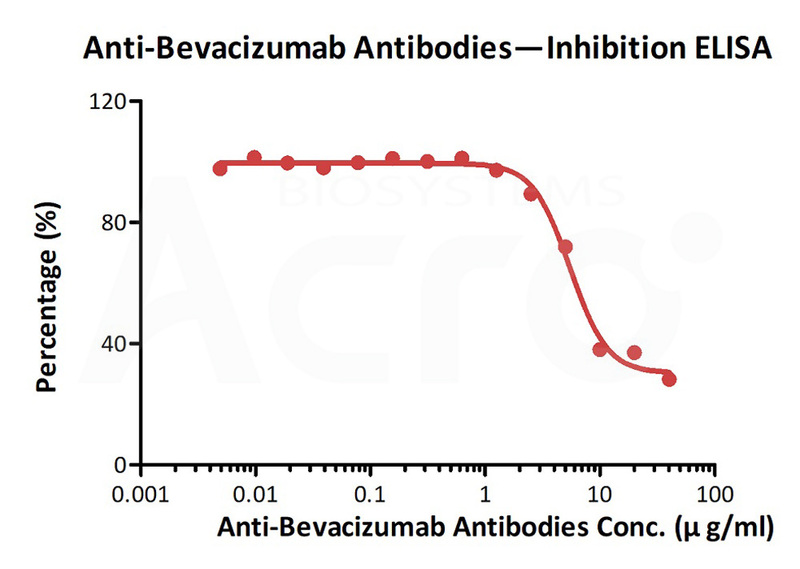 Immobilized bevacizumab at 2 μg/mL (100 μL/well) can bind pre-mixed Anti-Bevacizumab Antibodies (recommended for ADA assay) (Cat. No. BEB-Y9) and Biotinylated Human VEGF 165 (Cat. No. VE5-H82Q0) with a inhibition rate of 62%. Anti-Bevacizumab Antibodies (recommended for ADA assay) (mouse IgG1, Cat. No. BEB-Y9) captured on CM5 chip via anti-mouse antibodies surface, can bind human bevacizumab with an affinity constant of 1.92 nM.